Our names are Rick and Liz Kenitz. Briards came into our lives 25 years ago. Back then we never imagined how they would forever change our lives. We thought what a beautiful complex dog and were thrilled to have one enter our lives. Little did we realize that this breed would take us on such an adventure. 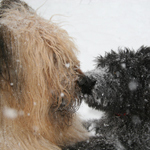 Over the years through our involvement with Briards we have made friends with people who we would have never had contact with without being “in Briards”. We have made lifelong friends who share the passion for the breed. We have been fortunate enough to travel across the US and Europe with our Briards. We have been fortunate to have travel to France to attend French Nationals on many occasions to help further our education of this wonderful French breed. We have come to appreciate the years of dedication that breeders before us had, without them we would not have the Briards we have today. 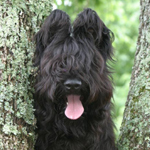 For years we have worked to produce Briards that can be recognized as quality Briards throughout the world. We have produced and owned National Specialty winners in France as well as the US. We have owned and bred AKC Best in Show Briards, had the top stud dogs in the country, owned the number one Briard in the country. We have bred or owned/co-owned Briards that have won five US Nationals, and the French National. We have bred Champions, National Specialty Winners, AOM, Grand Champions, obedience titled yada, yada, yada…. More important than awards is that we have been able to produce Briards that are healthy, wicked smart, have consistent temperaments … and the icing on the cake have great coats and oh they are beautiful also. We have bred dogs that cart, are therapy dogs, help with the livestock at the family farm, search and rescue, running companions, and most importantly beloved family members. 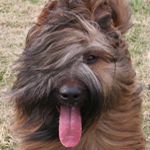 We don’t breed just to breed, we breed to try to improve on the pedigree, we are proud of our Briards…we have worked hard. 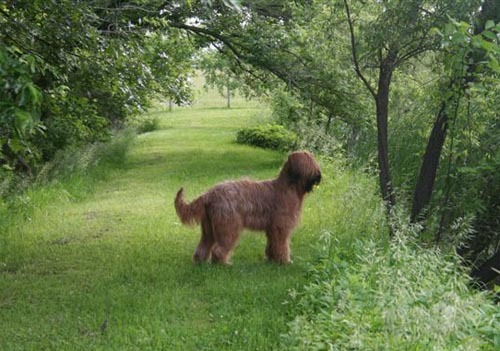 We only breed dogs that pass all of the health clearances, have a stable and steady temperament …and are recognized as a quality Briard any place in the world… Sometimes we breed to dogs that do not have their AKC Championship, what they do have is excellent health records, wonderful temperaments and beautiful breed type. The titles are nice but not the all-important deciding factor when deciding who to breed. 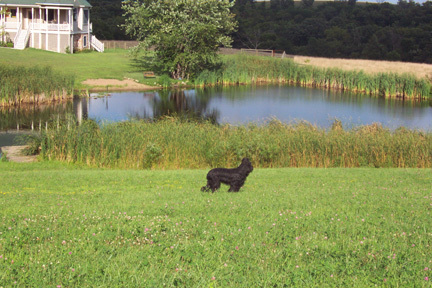 We have bred to dogs that were BIS show dogs and we have bred dogs that were not AKC Champions, and let me not forget…I have bred a male with a disqualifying fault (he was missing a pesky dewclaw)… you can go to Briardale Mass to read “Henry’s story. All of these dogs were dogs that I would have been proud to call my own, and we are proud of what they have produced. 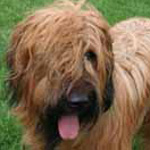 We are very careful about breeding, we don’t breed apples to oranges………we breed quality briards to quality briards…….. 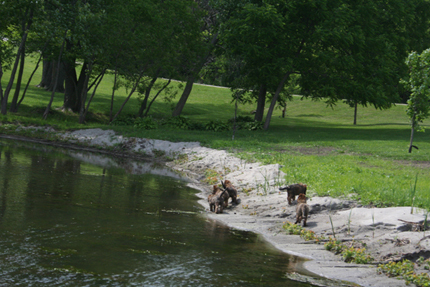 In the past we only bred if we intended to keep puppies from that litter, we have realized that we can longer do this. Rick has retired, which is wonderful but it also brings home the realization that …gulp…we are getting older. We have realized that even though our desire is to have many Briards live with us it is no longer feasible. So what we do now is place a few puppies from each litter into co-owned homes. The families get their wonderful companion and show dog and we retain the option to breed them when they become of age. They must pass all of our rigorous requirements. It has been and we hope will continue to be a win win situation for both the Briards and their families and ourselves. So you think you want a Briard. When you call us, we will tell you about the breed and try very hard to sell you on another breed. We do not believe that this is the right breed for everyone. If you want a dog that will just hang with you with no effort, training or socialization then this is NOT the breed for you. If you want a wash and wear dog. . . this is not the dog for you. If you are inconsistent, this is NOT the breed for you. If you are willing to do your homework, find the right breeder, get the proper puppy and then do a heck of a lot of work this MIGHT be the breed for you. The list is long, we will help you to determine if this is the right breed for you. When we ascertain that this is the right breed, and you decide you want to proceed the serious interviewing process will start. You will be asked questions that would make an IRS agent blush. . . where will the dog sleep, why do you want a dog….the questions go on forever. We will ask that you sit down and write something about your desires in temperament for your new family member, what role do you see this dog taking in your family? Do you want the “cheerleader” “the couch potato” the “cop” they all have different personalities. This is an A type personality breed, they are bred to be leaders. They need owners who are leaders, if you are not most Briards will gladly take the job, and by the way, you will not be happy! You need to really think about what you want, why you want it and what kind of work you are willing to do to get it. We will ask for references and supply you with ours. We expect for potential owners to do more research on their new potential family member who will live in your home than the car who stays in the garage. This is a 12-14 year commitment, we take placing puppies seriously and expect you to do the same. Once we have a comfort level with you and determine that a Briard may be the right dog for you, we will tell you the good stuff. The undying devotion.. the mind of a Briard that constantly amazes, the beauty and grace of this athlete…the list goes on. All of our puppies are born in my hand. We stay with the mother and puppies pretty much round the clock until they are 10-14 days old. They are handled daily, we do the super puppy exercises. We expose puppies to as much as their age allows. We bring children in to play with them. They play with our other Briards and our Havanese. The puppies are given a firm foundation to grow upon. 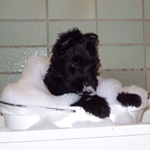 At 7 weeks we bring in a Tester who has never met the puppies to conduct their temperament tests. After the test Rick and I sit down and talk about the test results and what we have observed for the last 49 days. At that time we make the decision of who goes where. Sometimes we will not have a puppy that is a good match for the “potential home” If we do not have a puppy which we feel is right for you we will not send you a puppy. Our first “contract” is with our puppies. Our job is to produce healthy, sound, beautiful puppies and to place them in homes that they will thrive, a bad match can be devastating to both the new home members and the puppy. We work very hard to make sure we send the “right” puppy for you. We do not do “deposits” we encourage you to “shop around” you don’t just get a Briardale puppy you get us also. We will call and check up on you and your puppy. We will be available for the lifetime of your Briardale Briard. Copyright 2007. Olga Shulman at Briard Breeder. All rights preserved.